FINALLY, the doors to AudioBook Profits swing wide open…. to the NEXT LEVEL of Publishing Profits! You know that a core tenant of my business is to build as many free-standing, set-it-and-forget-it, passive income, profit centers. That is why over the years I have built and taught you to build a catalog of Amazon Kindle publications and Barnes and Noble “Nook” books and even taught how to publish physical booksusing Amazon’s print-on-demand technology. But truth be told I have long had my eye on converting my written publications into audiobooks. I mean look around — everywhere you look people have earbuds and headphones plugged into their ears listening to podcasts, music and YES audiobooks. IN FACT, the demand for quality audiobooks is tremendous! Several years ago when I was just starting to put up my catalog of Kindle and Nook books (now at over 2500 titles in each) I did what I teach to all my students. I began to look for ways to repackage and repurpose my content. I viewed audiobook production as a natural progression. I knew that with the popularity and ease of use of the iPod and other MP3 players that more and more people were looking for audio content coupled with the fact that audio was the only content you could consume while engaged in another activity like walking your dog, made audiobooks were poised to be the next great frontier in digital publishing. AND Audible WAS the only way you could get your audiobook into the audiobook categories on Amazon. In my market research, I learned that getting your audiobooks into the audiobook categories was crucial to the long term profits and key to the set-it-and-forget-sales I was looking for. Accordingly, once I determined that the only way into Amazon with my audiobooks was through Audible.com I started looking for a way in; a way to publish my stuff through Audible.com much the same way I was using the Kindle Direct Publishing platform to publish my Kindle books. Problem was such a way did not exist (at least none that I could find). So after scouring the Audible website I found a customer service email address. I wrote Audible and asked how I could become an approved audiobook publisher. I never got a response… so after several weeks I wrote another email and asked again. Finally, I did some digging and found the phone number of Audible corporate headquarters in Newark, New Jersey. I called and amazingly got through to someone and asked the question again. I explained that I was a small, but legitimate publisher with a number of titles that I wanted to publish as audiobooks. After hearing my request they went on to tell me that Audible primarily worked with major trade publishers like Random House, Simon and Schuster and other biggies. This person said while it was possible to become an approved publisher it was a difficult process. She said that once a formal request was made that it may take months to get an answer and it may not be and answer I’d like. She then quickly suggested that I work with one of Audible’s approved “aggregators”. These production studios had approved status and could handle the entire production process. I got excited and asked her for a list of these firms. She named two or three of them and suggested I simply Google search it for others. I thanked her for her time and then immediately began a web search for the audiobook production studios she recommended. I found them on a quick Internet search but as I perused each of the website one fact became abundantly clear. In order to produce an audiobook through one of these approved companies you had to pony-up major cashola! THOUSANDS of dollars! For One Single AudioBook! This kind of cash outlay was only warranted if the audiobook were going to be a big seller. That, I knew, would would take marketing, time and effort. In other words, this high-dollar advance payment method of audiobook creation was not conducive to the publish-it-and-let-it-fend-for-itself kind of publishing business I was running. That’s right folks for the vast majority of my Amazon and Barnes and Noble titles I simply publish them and then rely on the marketplace to sell them. I do little to no marketing of them once I give birth to them. Consequently, I was looking for a Kindle-like (free) publishing platform and what existed was a vanity press pay up front kind of model. I tried several of the recommended audio production companies and found several more that could do the job but in the end they were all too expensive and required too much out of pocket to make it worth my time. So after several weeks of trying and looking I developed a gut feeling that I should simply shelve the idea. Recently, Audible OPENED a Feasible & Economical Way To Publish High-Quality AudioBook Versions Of ANY Kindle or Physical Book Published ON Amazon.com. In many respects it parallels the ease of use of Kindle publishing. And to say I am stoked about it is an understatement! My latest Step-By-Step training program Designed To Help YOU Produce AudioBook versions of every single book you have up on Amazon! 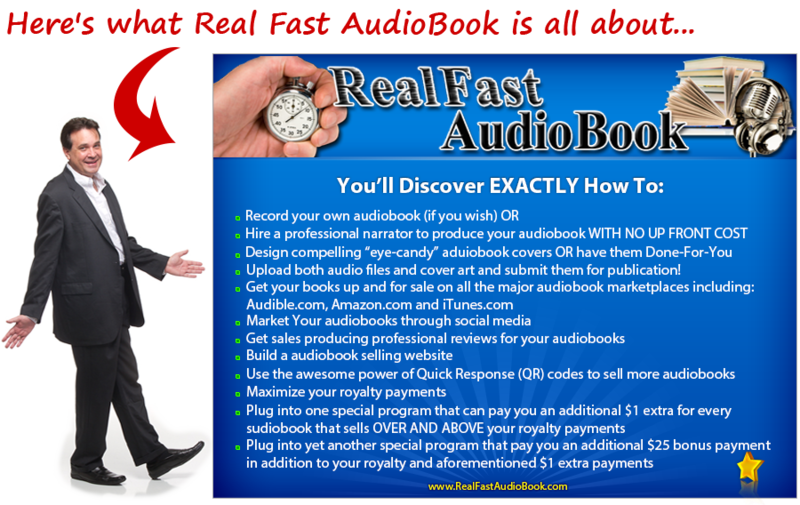 I mean Real Fast AudioBook gives you EVERYTHING you need to get your audiobook up and selling! !!! And this is important !!! – Real Fast AudioBook shows you how to do this even if you’re a rank beginner; even if you don’t have a great radio-announcer voice; even if you don’t have a single Kindle book on Amazon (remember you can make audiobooks only if the Kindle/ physical version is first available on Amazon). Yes… Real Fast AudioBook has you covered there too because also included is a special Step-By-Step Kindle training. Best part is Real Fast AudioBook system is proven to help get your book up on the big three audiobook marketplaces. And let me tell you something… if your audiobooks aren’t up on iTunes, Audible and Amazon you may as well not even bother producing an audiobook. Real Fast AudioBook shows you EXACTLY how to do it in Easy-Baby-Step format because we show you via Internet video. The idea is you can watch the training in one window as we show the detailed steps of how to professionally produce your audiobooks in another window. And here’s the best part — there is no guesswork! Plus, all the videos can be viewed and downloaded to your iPhone, iPad or computer. Just to give you an idea on what this system is worth keep in mind that there nothing else like it on the market. This is the most complete, thorough and detailed training on how to publish professional audiobooks. If you could find another program as complete as Real Fast Audio Book (you can’t) you could go into a professional studio and get help recording your audio and pay up to $1500 just for one session! 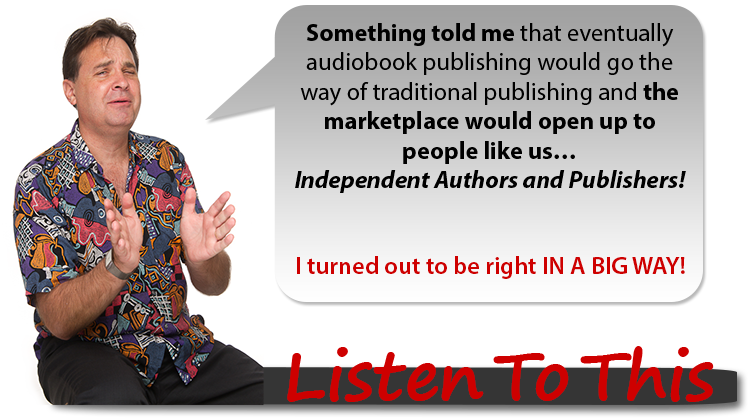 IF you are serious about producing High-Quality audiobooks that open up a Brand New Income Source for you then, you can’t afford to NOT invest. And the good thing too is that the tuition in this program is only $597. So all of the risk is on us… enroll in this high-level training here! Get Real Fast AudioBook for ONLY $597 Now!